Welcome to my blog! I hope you're all having a wonderful weekend! 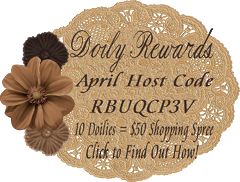 Here's a great way to end your weekend...a Blog Hop! 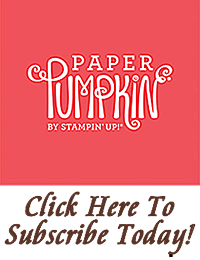 This RemARKably Creative Blog Hop features new products from the 2018-2019 Annual catalog. 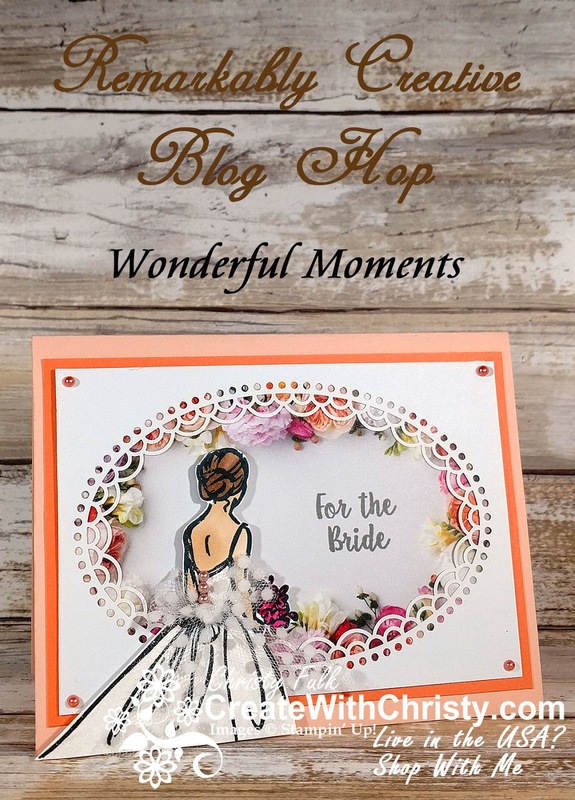 I picked the beautiful, and elegant Wonderful Moments Stamp Set for my card. This is the second card I've made with this set, and you can see the first one I made by CLICKING HERE. I've also used a few other new products...Petal Promenade Designer Series Paper (DSP), Delightfully Detailed Laser-Cut Paper, Share What You Love Artisan Pearls, and my favorite ribbon right now, Whisper White Polka-Dot Tulle Ribbon (see how you can get this ribbon free from me below). 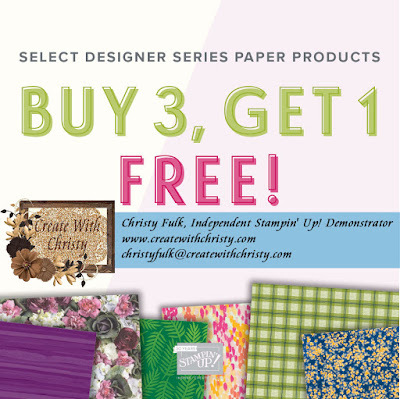 The Petal Promenade DSP is one of the DSP packs that's a part of the Buy 3, Get 1 Free DSP Sale. I love how the floral frame looks behind the laser-cut paper. I had so much fun "dressing" the bride, too. 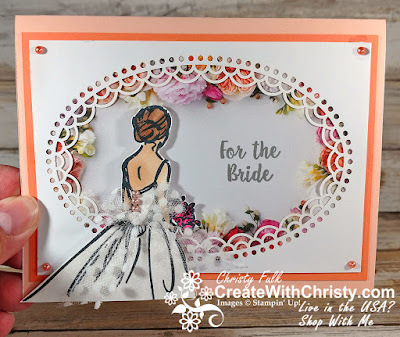 I colored her hair and skin with Stampin' Blends, and colored her wedding gown with the Clear Wink-of-Stella Glitter Blush to make the gown sparkle. I then added pearls for her gown buttons and added the tulle bow, keeping the tails of the bow long. I really wish you could all see it in person. It's so hard to see the shimmer in her gown in the pictures. 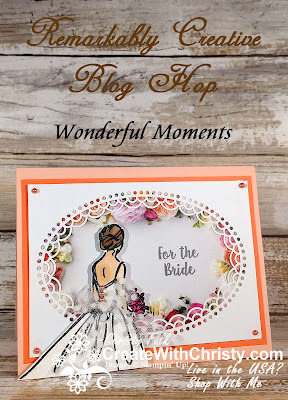 Petal Pink: 5-1/2" x 8-1/2"
Grapefruit Grove: 5-1/4" x 3-3/4"
Whisper White: 3" x 3-1/4"
Delightfully Detailed Laser-Cut Paper: 5" x 3-1/2"
Whisper White Polka-Dot Tulle Ribbon: 12"
Cut one of the floral frames out of one of the Petal Promenade DSP sheets, keeping a little border of the plain part of the paper around the floral frame. Cut out an oval frame section from the Delightfully Detailed Laser-Cut Paper. The laser-cut piece should be 5" x 3-1/2". Attach the laser-cut oval piece onto the floral frame, making sure to center the flowers within the oval frame. 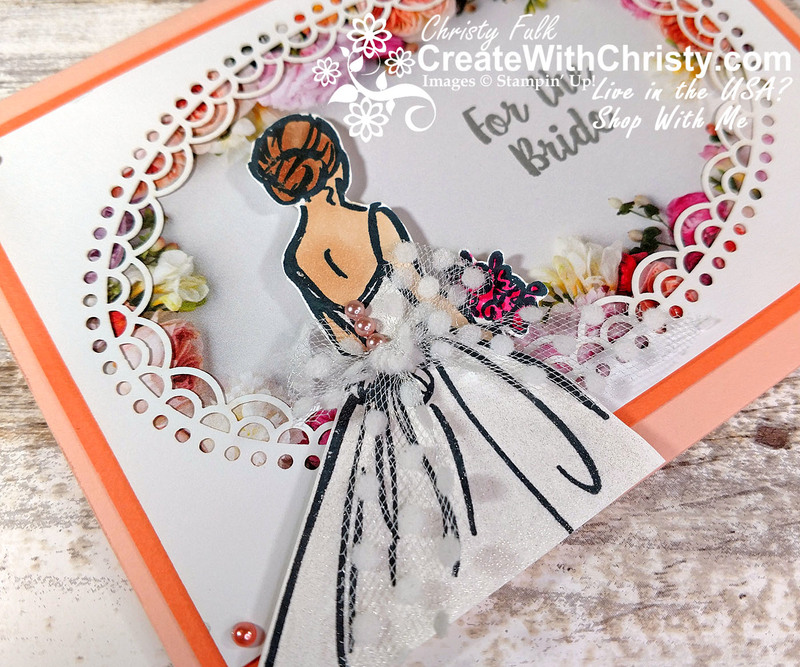 Stamp the "For the Bride" stamp from the Wonderful Moments Stamp Set onto the right side of the floral layer using the Basic Gray Classic Stampin' Pad. Attach them onto the center of the Grapefruit Grove piece. Fold the Petal Pink piece in half (fold on top) to form the card base. Attach the Grapefruit Grove piece to the center of the card front. 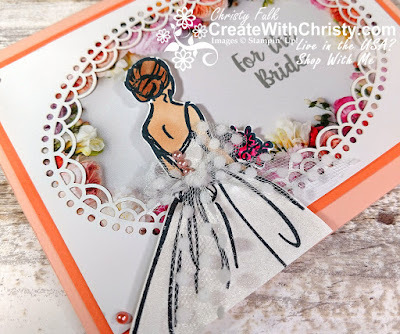 Stamp the bride stamp onto the Whisper White piece using the Tuxedo Black Memento Pad. Color her hair with the Bronze Stampin' Blends Marker. Then, color over the parts that need to be darker with the same marker. 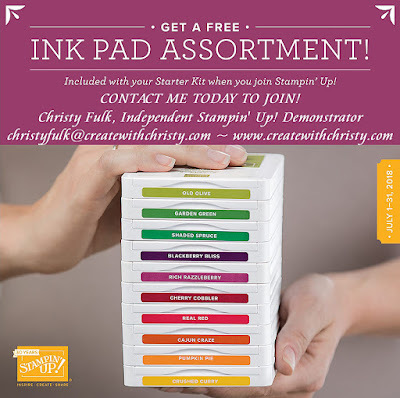 Color her skin with the Ivory Stampin' Blends Marker. Color her flowers with the Lovely Lipstick Stampin' Blends Combo Pack. Color her gown with the Clear Wink-of-Stella Glitter Marker. Fussy cut her out using Paper Snips, keeping her gown bottom a straight-cut. 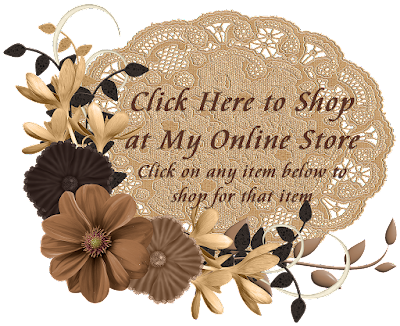 Attach three Petal Pink pearls from the Share What You Love Artisan Pearls over the stamped buttons. 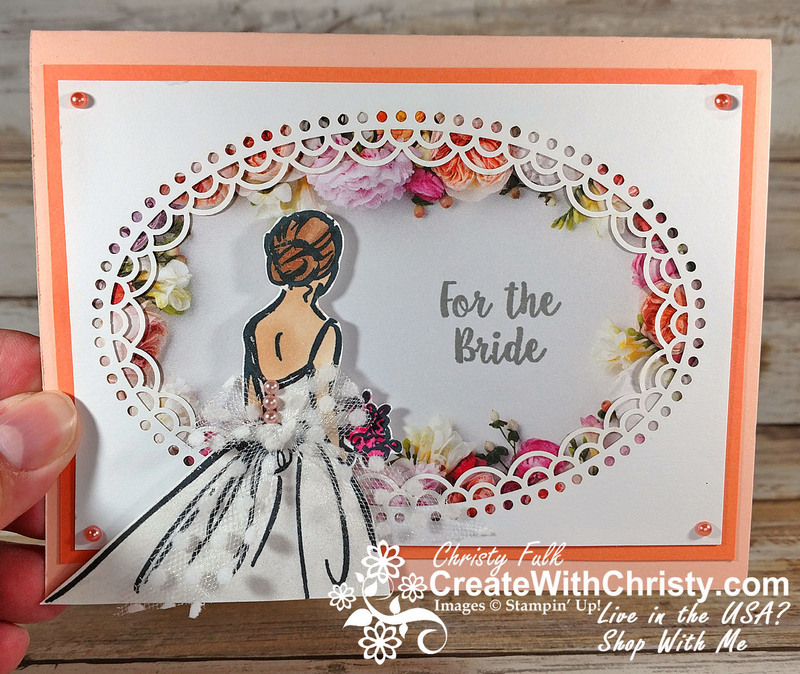 Attach her to the bottom, left corner of the card using Stampin' Dimensionals, lining the bottom of her gown with the bottom edge of the card base. Tie the Polka-Dot Tulle Ribbon into a small bow. Attach the bow to the waist of her gown with a Mini Glue Dot. Trim the ribbon ends at an angle, but they need to be the length of her gown. Attach a Grapefruit Grove pearl from the same pearl set as above onto each corner of the laser-cut oval piece. Well, I hope you enjoyed my card. 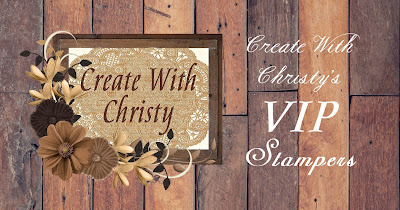 Make sure not to miss the rest of the great projects in the blog hop. The list is below. 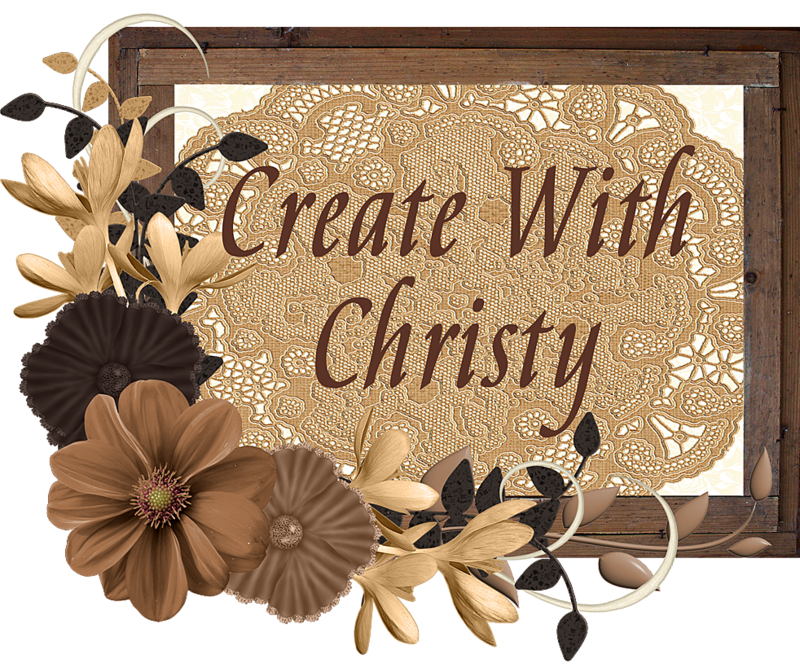 To help you remember where you're at, this is Christy Fulk - Create With Christy - USA.